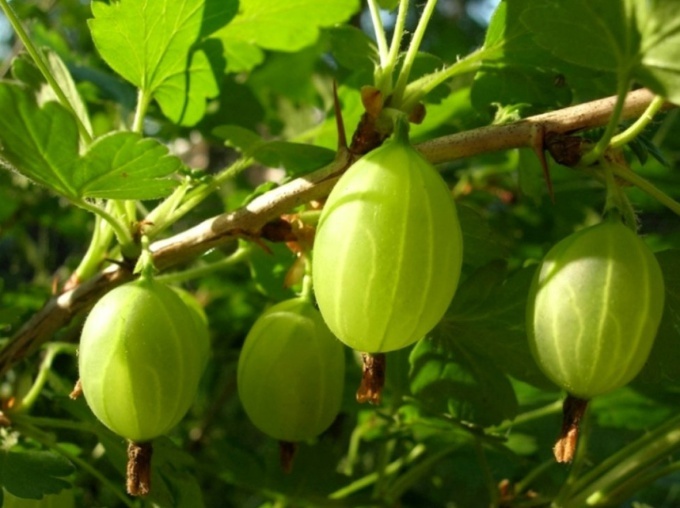 Gooseberries — not particularly fastidious, and therefore very popular garden culture. The berries are delicious in and of themselves. From gooseberry you can cook some great jams. One of them has deservedly received the title "Royal". This jam is truly worthy of the Royal table, as not only delicious, but also looks beautiful. Cooking it requires some patience but the result is worth it. Calculate the number of products. 5 glasses of selected berries of gooseberry need 2 handfuls of cherry leaves, 3 cups water and 7 cups of sugar, and a little walnuts. Nuts peel and chop. Of the total number of cherry leaves, put a dozen, you will need them later. Prepare the berries. For this jam you need to select large and strong, which will collapse if they are pierced. Wash the gooseberries. Remove the stalk. Making each berry lengthwise incision with a sharp knife, scoop out her seeds, and insert the pieces of walnut. Make a decoction of the cherry leaves. In an enamel saucepan, pour 3 cups of water and lower back clean cherry leaves. Put the saucepan on medium heat and bring the water to a boil, then immediately remove the broth. The broth should be green. Let it cool to room temperature and put the casserole in the refrigerator overnight. Cook syrup. 2 cups of broth, take 7 cups of sugar, stir and bring to a boil. Stir in the boiling syrup prepared gooseberries and boil for 12 minutes. Dip in the syrup some more cherry leaves and cook for another 2-3 minutes. Sterilize jars and lids. Before you can fill jam, pour over boiling water banks. Pour the hot jam and roll up from the banks. 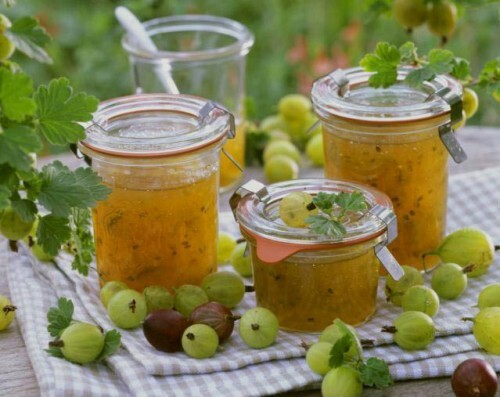 Gooseberry jam is better to take a little underripe than overripe. Try to find berries of the same size. Walnuts are thoroughly clean. Should remain only the pieces of the nucleolus. Chop them, but do not RUB in the powder. Cherry leaves must be clean and without damage. 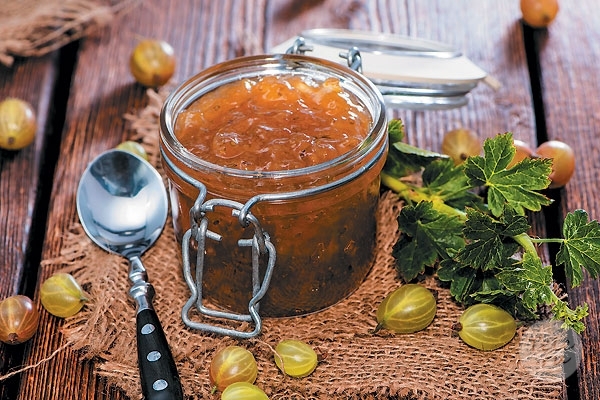 In Russia the gooseberry jam was a luxury treat. 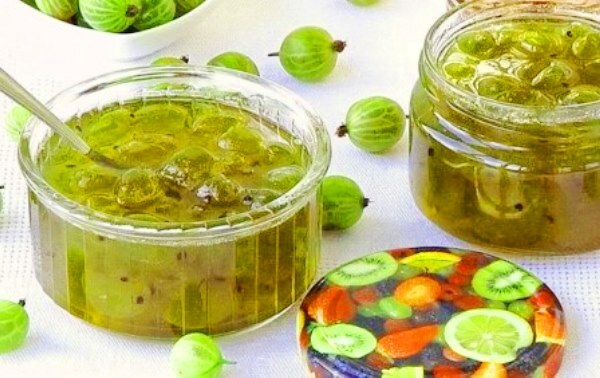 A sign of culinary skill was considered the ability to cook gooseberry jam so that inside each berry was hidden nut. Of course, modern Housewives are hardly capable of such feats, but to make a simple and delicious jam made from gooseberries today, even the novice cook. The classic recipe is one of the most simple, it does not require any special culinary skills, so each can cook his young mistress. My gooseberries under running water and clean it from the stems using scissors. 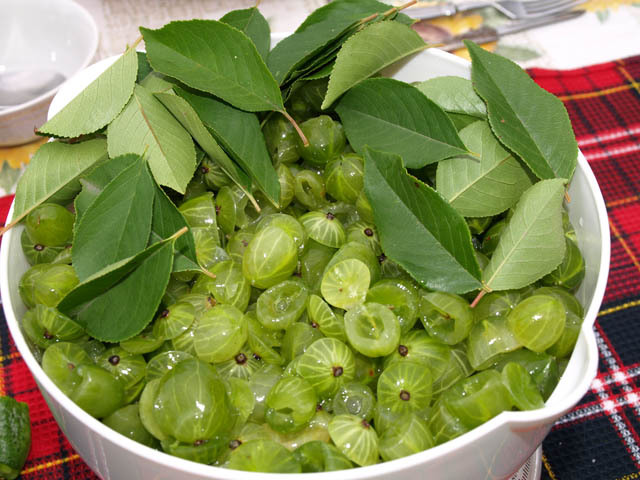 Put the gooseberries in a saucepan and fill it with water so that it completely covers the berries. Include low heat and bring mixture to a boil, stirring occasionally berries with a wooden spoon. When the water boils, pour in a saucepan the sugar and mix thoroughly. Wait for boiling, then remove the pan from the heat and remove the foam that formed on the surface. The finished gooseberry jam cool and pour in banks. This name it received because of its delicious taste, awarded the highest praise from Royal personages. This recipe has a more complex technology of preparation, but worth the effort justified. As a result you get extremely tasty, tender and flavorful treat. Gooseberries wash and sort, removing the stems. Then each berry cut in half and remove the seeds. Put the berries in a saucepan and pour ice-cold water (the water should be pre-cooled in the refrigerator for 5-6 hours). Cherry leaves my under running water, put in the pan, pour 1 liter of water, then add citric acid. Pan put on fire and cook until until the sugar has dissolved. After boiling, the broth should then another 5 minutes, then decant. In cherry decoction, add sugar, again put it on the fire and cook until the sugar is dissolved, then add vanilla, vodka and carefully parasivam. Gooseberry fill with the mixture and leave to infuse for 30 minutes. Then put the berries into the fire, waiting to boil and cook for another 10 minutes. The finished gooseberry jam spread on banks and immediately roll. Jam, prepared according this recipe, will definitely appeal to fans of unusual and exotic combinations. ¼ Cup of lemon juice. Gooseberry is well washed and purified from the tails. Mango wash and cut into small pieces. Enamel pot filled with water and put on the heat, add mangoes, gooseberries, sugar and lemon juice, then carefully stir the contents. Bring mixture to a boil, stirring constantly and removing the foam. When fruit weight comes to a boil, cook it for another 30-40 minutes until thick. Ready exotic delicacy is poured into prepared banks and roll. If jam made from gooseberries to add an orange, we get an incredibly tasty treat with a pleasant acidity. In addition, this jam does not require heat treatment, so that its preparation will not take a lot of time and effort. Gooseberries wash, dry and cut away with their tails. Each fruit cut in half and remove the bones. My oranges and purified from the peels. 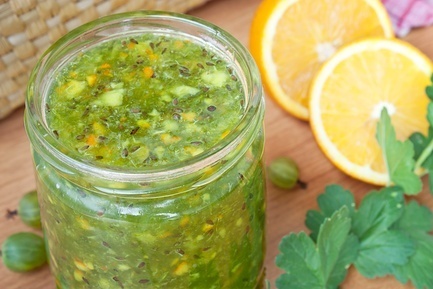 Citrus fruits and berries puree them in a blender until smooth. The fruit and berry mixture fall asleep sugar and mix thoroughly. Leave the jam for a few hours to let the sugar completely dissolve. The dessert is ready, we pack in sterilized jars, cover with lids and refrigerate.